Living in Capitol Hill means beautiful views and a nice neighborhood. 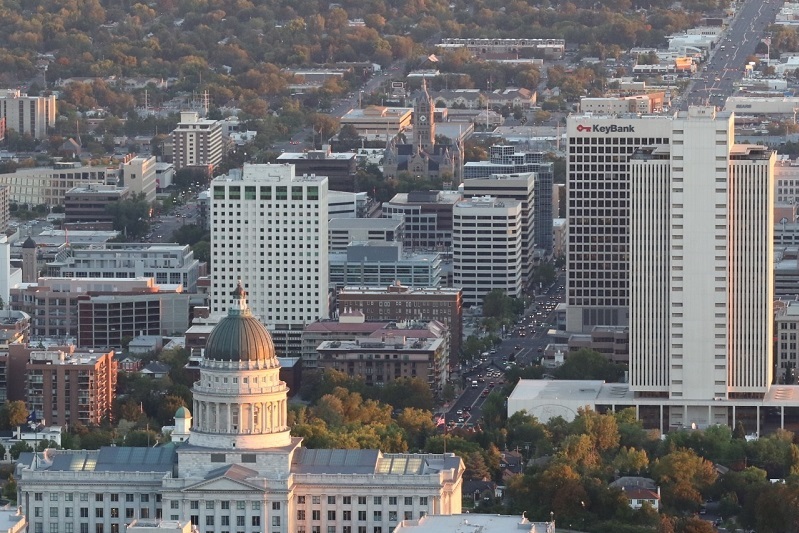 Though it’s almost entirely residential, the neighborhood is (of course) home to the beautiful granite Utah State Capitol Building, and it’s within walking distance of some of Salt Lake City’s best spots. Walkable Memory Grove park is on the eastern border of the neighborhood, and Temple Square and City Creek Center are just across North Temple Avenue to the south. There is also a great mix of homes and condominiums. Capitol Hill is unique because of the nearby headquarters of the LDS church, the multicultural influence, and the vibrant LGBT community. The Capitol Hill neighborhood, which includes the Marmalade district, has a mix of young families, young professionals, and many older residents. There are some homes with really beautiful architecture, and the area has a nice feel because of the well-kept yards, mature trees, and walkable sidewalks and paths. There aren’t many homes for sale, and the prices are on the higher end because of the location. Since the area is small and the view nice, the home prices are slightly higher than other areas of Salt Lake (approximately $267,000 on average, according to Zillow, versus $230,000 for Salt Lake). Most homes for sale have been renovated and modernized. Rentals in the neighborhood range from small one-bedroom to good-sized 3-bedroom apartments. The average rent is $1,400 per month. As with every other Salt Lake neighborhood, cars are the most common mode of transportation, and most homes have space to park at least one vehicle. Because the streets are narrow and sloped, cars aren’t always the ideal method of transport, though, and it’s not uncommon for someone working downtown to commute on foot. The UTA bus system and TRAX commuter train are within a few minutes’ walk of the neighborhood. If you live in the area immediately around the Capitol itself, you can even ride the bus for free into downtown. You can easily get to the airport, the University of Utah, and south or north of the valley. There are few places to get food within Capitol Hill. Being almost entirely residential, Capitol Hill doesn’t have a lot of restaurant options within its borders, the notable exception being the popular Em’s Restaurant. But within six blocks, in the Avenues area next to LDS Hospital, is the Avenues Proper Restaurant. This nearby restaurant serves creative, trendy dishes along with local beers. On South Temple, 5 minutes from Capitol Hill, is the bright pink-colored Mrs. Backer’s Pastry Shop, which features homemade cookies, cakes, and donuts. South of the neighborhood, within a 10-15 minute walk or 5-minute drive, you can get plenty to satisfy your tastebuds with Greek, Italian, Mexican, and American fare. For groceries, you’ll have to leave Capitol Hill, but there are several options nearby. Harmons Grocery Store at City Creek is a 5-minute drive to the south, and there is a Smith’s Marketplace in the nearby Avenues neighborhood. You can also find some nice ethnic grocery stores and bakeries in the surrounding downtown area. Within this neighborhood, the beautiful Utah State Capitol Building has a very interesting one-hour tour hourly from 9–5 p.m. Monday through Friday. In a nearby neighborhood is the beautiful Cathedral of the Madeleine. This historic building has stunning architecture, stained glass windows, and a beautiful pipe organ. Just south of the neighborhood is Temple Square. Temple Square is very visitor friendly with gardens and fountains, a visitors’ center, and the Family History Library. North of the Capitol Building, a 5-minute drive away, is Capitol Hill’s best outdoor feature: Ensign Peak. This historic location was used by the Mormon pioneers to survey the entire valley, and they chose it on purpose. Completing this short, steep hike rewards you with a great view of the Salt Lake Valley. Just down the hill from the Capitol is Memory Grove Park, with Freedom Trail running through it. The park is great for walking, jogging, or biking, and it is a popular destination for dogs and their owners. You can also find lawns and wide sidewalks around the Capitol Building. Ultimately, Capitol Hill is a quiet neighborhood, and entertainment options here are few. Residents are, however, extremely close to downtown and everything it provides. You can easily catch a Jazz game or check out the many art museums and theaters. The charming Capitol Hill neighborhood is made up of tree lined streets, the Capitol Building, and Memory Grove Park. Its prime location means that within an easy walk or drive, residents have food, entertainment, and nightlife. This Salt Lake City gem is a great place for residents of almost age or family makeup.